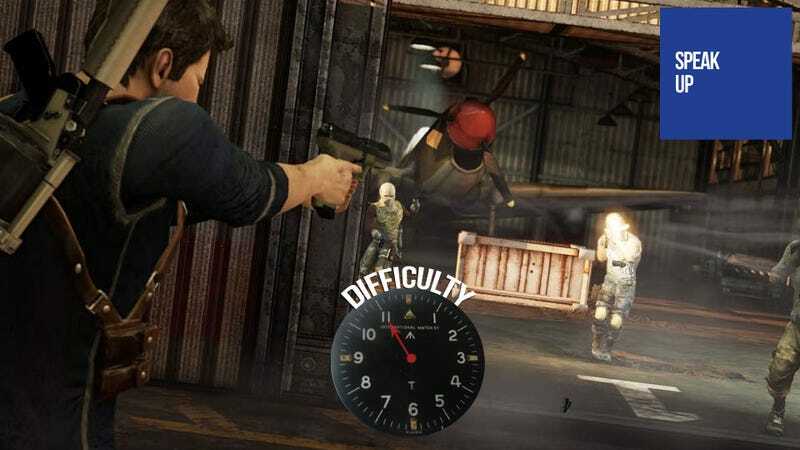 What Difficulty Setting Do You Play On, or How Hard Do You Like It? With today's news that BioShock Infinite will include a special old school difficulty mode, commenter Blessrok is curious about what difficulty setting you play on by default? Are you an easy-going gamer, or do you like to be punished? Tell us in today's Speak Up on Kotaku. I don't know about anyone else, but for me I just like to play a game on whatever the default difficulty setting. My reasoning has always been "Because this is the difficulty they intended me to play it at", but certain instances I'll bump it up. Those cases were more a fact of the last game in that series on "normal" was a bit too easy. I played Uncharted on default, but bumped Uncharted 2 and Uncharted 3 up to "hard" (if "crushing" was available at the start I'd put it there. I never replay a game on a harder difficulty level. It's just not me) and felt that I had a bit more fun. So what about you? Do you knock it down on your first play, turn it up, or play as I refer to it, the developers' intended difficulty level?